When evaluating a cryptocurrency, one can always look to the market capitalization to figure out how much the coin is "worth". This is just the current ruling price multiplied by the amount of coins in circulation. It could be viewed as the "value" of all coin sitting in holders crypto-wallets, but of course if everyone should try and sell to realize this value at the same time, obviously the whole value would not be realized. For this reason, market capitalization can be a bit misleading when determining the significance of a crypto currency, especially if the crypto is illiquid. Also, a lot of large market-cap coins originated from a hard fork (such a Bitcoin Cash) so there is also a train of thought that the "inherited market cap" from the fork is a bit misleading, as quite often very few people claim their inherited coins from a fork. Another metric that could prove useful in determining the significance or "adoption" of a cryptocurrency is the daily trading volume. This is the value, in Dollars, of the crypto currency traded on the worlds exchanges and is an excellent measure of how much the crypto is being "used" or "transacted". It is also a great indication of the liquidity of the crypto. This is therefore a very useful addition to Market capitalization in measuring the significance of a cryptocurrency. The price of a cryptocurrency is very much driven by adoption, speculation, hype, public interest and so forth, and the best place to measure these factors is social media and google searches. In fact, with cryptocurrencies, it is said that "social media penetration is the new market capitalization". To this end one can measure quite a few metrics, such as the number of Reddit/Twitter/Facebook subscribers to the cryptocurrencies’ official social media pages as well the public interest being shown via the number of search engine searches for a cryptocurrency etc. We would argue that public interest and social media penetration is equally important as market capitalization and daily trading volume when measuring a cryptocurrencies significance. To see how much Bitcoin is directly correlated to public interest, have a look at this article. Surprisingly, Bitcoin is ranked second in terms of social media penetration and public interest despite being the top ranked crypto for market capitalization and monthly trading volume. Our thesis is that beginners to crypto or those who do not have the time to fully research alt-coins keep their activities to this list to narrow down the already high risks of crypto. The idea is to have more of your portfolio weighting to the coins at the top and less to the coins at the bottom. On the premise that one wants to find future ten-baggers with low market cap and low trading volume but high public interest, then STELLAR and NEO are potentials that foot the bill. 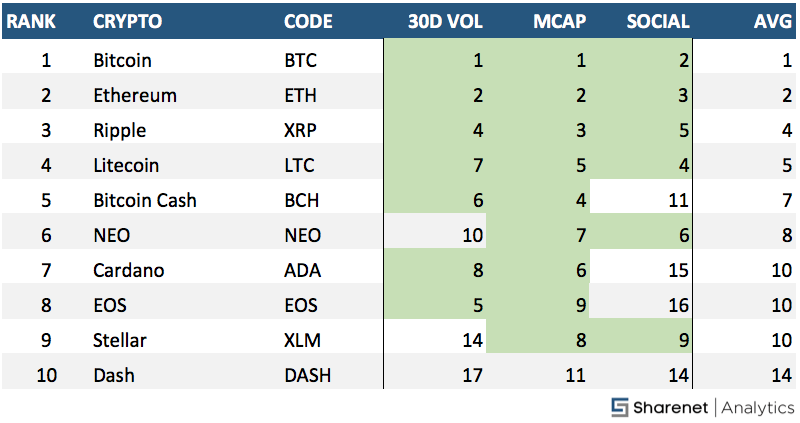 We will now briefly discuss each cryptocurrency on this TOP-10 list, but before we do, please note that cryptocurrencies are still a young, emerging, unregulated asset class with significant volatility. Corrections of up to 80% are not uncommon and therefore you should never be deploying funds you are not prepared to completely lose. That being said, the asymmetrical potential gains could make avoiding this asset class regrettable in the future, and any Wealth Planner worth their salt will allow you a prudent allocation for "alternative assets" providing your financial circumstances allow. There are several rough guidelines for what constitutes an appropriate allocation to "alternative assets" ranging from 1-5% of your assets but a lot depends on your personal circumstances. Sharenet have licenced wealth planners well versed in all matters crypto and their associated tax liabilities so you can always contact wealth@sharenet.co.za should you want more information on helping you establish your risk profile and net worth, both inputs which you will need in your decision making process. To see how a tiny allocation to crypto can potentially boost your traditional equity returns, see this interesting analysis. Bitcoin is a digital asset designed to work as a medium of exchange that uses cryptography to control its creation and management, rather than depending on central authorities. The creator, Satoshi Nakamoto, wrote the original white paper in November 2008 and the Bitcoin network came into existence in January of 2009. As it is the biggest and oldest cryptocurrency, it’s called the "reserve currency" and a lot of other cryptos are priced in Bitcoin. At this point in time it’s difficult to tell if the use case for Bitcoin is trending toward transacting or acting as Digital Gold. What we like: Bitcoin has the largest user base and network effect of all cryptocurrencies. It has very strong, tried and tested security and has the ability to survive the harshest attacks from malevolent actors. What we don’t like: The lack of consensus on the blocksize/scaling debate. This has led to slow transaction times and ridiculous fees, vastly diminishing the utility of Bitcoin as a settlement layer/currency. We also dislike the lack of community-driven corrective action over the core development team. It would seem like the greatest vulnerability of Bitcoin is the hijacking of the Core developers by a less than benevolent actor. Ethereum is a decentralized platform that runs smart contracts - applications that run exactly as programmed without any possibility of downtime, censorship, fraud or third-party interference. Ethereum is an open-source, public, blockchain-based distributed computing platform featuring smart contract (scripting) functionality. It provides a decentralized Turing-complete virtual machine, the Ethereum Virtual Machine (EVM), which can execute scripts using an international network of public nodes. Ethereum also provides a cryptocurrency token called "ether", which can be transferred between accounts and used to compensate participant nodes for computations performed. "Gas", an internal transaction pricing mechanism, is used to mitigate spam and allocate resources on the network. Ethereum was proposed in late 2013 by Vitalik Buterin, a cryptocurrency researcher and programmer. Development was funded by an online crowd sale during July-August 2014 (the first real Initial Coin Offering or ICO). The system went live on 30 July 2015. What we like: The smart contracting concept that gave birth to Ethereum can literally change the way we do business and interact in a digital world. The potential of this platform is so vast that it is in fact inconceivable at this point in time. ETH also has the first-mover advantage and network effect in the dApp platform space. What we don’t like: After the DAO hack, the Ethereum blockchain was reversed to refund investors. This goes against the immutability principal of what a blockchain should be. It is highly questionable that this would be able to be performed again, but it has left a bitter taste for some purists. This action drove the hard fork of Ethereum and gave rise to Ethereum Classic, the unaltered chain. We also don’t like that Ethereum uses its own programming language, creating barriers to entry for potential contributing developers. However, this does enhance the security of the applications created. Ripple is a real-time gross settlement system (RTGS), currency exchange and remittance network by Ripple. Also called the Ripple Transaction Protocol (RTXP) or Ripple protocol, it is built upon a distributed open source Internet protocol, consensus ledger and native currency called XRP (ripples). Released in 2012, Ripple purports to enable "secure, instant and nearly free global financial transactions of any size with no chargebacks." It supports tokens representing fiat currency, cryptocurrency, commodity or any other unit of value such as frequent flier miles or mobile minutes. At its core, Ripple is based around a shared, public database or ledger, which uses a consensus process that allows for payments, exchanges and remittance in a distributed process. The network is decentralized and can operate without Ripple (enterprise), it cannot be shut down. Among validators are companies, internet service providers, and the Massachusetts Institute of Technology. Used by companies such as UniCredit, UBS and Santander, Ripple has been increasingly adopted by banks and payment networks as settlement infrastructure technology, with American Banker explaining that "from banks’ perspective, distributed ledgers like the Ripple system have a number of advantages over cryptocurrencies like bitcoin," including price and security. What we like: The ability to have fast and cheap transactions within the conventional banking system and between sovereign currencies. This holds the potential to improve the efficiency of the conventional banking system and decrease the cost of remittances. It is highly scalable and thus can handle thousands of transactions per second. What we don’t like: The Ripple token (XRP) is centralized and pro-establishment, meaning that it is a tool aimed to be used by conventional financial institutions. As such, it is not a true cryptocurrency in the strictest sense of the word. Furthermore, 20% of the original XRP tokens created, where held by the creators. This means that they have the ability to significantly manipulate price, should they choose to dump it on the market. Litecoin (LTC or Ł) is a peer-to-peer cryptocurrency and open source software project released under the MIT/X11 license. Creation and transfer of coins is based on an open source cryptographic protocol and is not managed by any central authority. While inspired by, and in most regards technically nearly identical to Bitcoin (BTC), Litecoin has some technical improvements over Bitcoin, and most other major cryptocurrencies, such as the adoption of Segregated Witness, and the Lightning Network. These effectively allow a greater number of transactions to be processed by the network in a given time, reducing potential bottlenecks, as seen with Bitcoin. Litecoin also has almost zero payment cost and facilitates payments approximately four times faster than Bitcoin due to its faster block generation time of 2.5min as opposed to 10 minutes. What we like: Fast transactions, low costs transactions and the implementation of layer 2 scaling tech such as segwit and the lightning network. This serves as a great testnet for Bitcoin. What we don’t like: Litecoin is very similar to Bitcoin, as such we foresee that it will face some of the same challenges in the governance area as the coin scales. This could lead to consensus issues and forks. Bitcoin Cash (BCH) is a hard-fork of Bitcoin that was created in August 2017. Upon launch, BCH inherited the transaction history of the original bitcoin (BTC) cryptocurrency on that date, but all later transactions were separate.� So, everyone who held Bitcoin on the date of the fork "inherited" Bitcoin Cash for free. This is why it has such a large market capitalisation. BCH has been broadly adopted by digital currency exchanges the world over. Many people believe that BCH is the "true Bitcoin" as envisaged by the original Satoshi Nakomoto Bitcoin white paper. The main upgrade offered by Bitcoin Cash is an increase of the block size limit from 1Mb to 8Mb. This effectively allows miners on the BCH chain to process more payments per second. This makes for faster, cheaper transactions and a much smoother user experience. What we like: Fast transactions, low transaction costs and large block sizes, which indicates the commitment to scaling on-chain. Regardless of what the trolls say, this coin follows the vision laid out in Satoshi’s whitepaper. Furthermore, we are agnostic towards either on or off-chain scaling, and as such are glad that there is an experiment unfolding before us, testing the utility of both. We also like the competition between dev teams on the BCH protocol. Competition is healthy. What we don’t like: The petty infighting between BTC and BCH. The second, greater issue, is that of centralization. With larger blocks comes the need for greater bandwidth capacity to broadcast new blocks to the network. Inevitably this leads to the need for a data centre, which is a single point vulnerable to attack by malicious actors. A third cause for concern is that of large blocks combined with an ever-decreasing block reward (halving) and low transaction fees. At some point, it becomes non-economical to mine, thus decreasing the security of the overall network. Admittedly, this is purely theoretical at this point. NEO, formerly Antshares, is China’s first ever open source blockchain and is also known as "China’s Ethereum". Founded in 2014, NEO’s mission has been to reinvent the way commerce is done. Motivated by this, NEO has been created to shift our traditional economy into the new era of the Smart Economy. Neo was developed by Shanghai-based blockchain R&D company "OnChain". OnChain was founded by CEO Da Hongfei and CTO Erik Zhang. Research on Neo started around 2014. In 2016, Onchain was listed in the Top 50 Fintech Company in China by KPMG. What we like: The current state of scalability of NEO, it can handle far more transactions than its main competitor, Ethereum. Is coded in widely used programming languages, such as Java, allowing most developers to contribute and use the platform for dApp creation. What we don’t like: It can’t be hard forked. This could bring the entire coin down if development proceeds in a direction that is undesirable by miners and users. Cardano is a smart contract platform, similar to Ethereum, with a focus on security through a layered architecture. It’s the first blockchain project to be created from scientific philosophy and built on peer-reviewed academic research. The team is building Cardano with both the end-user and regulators in mind. They’re attempting to find a middle ground that balances the need for regulation with the privacy and decentralization principles at the core of blockchain technology. Unlike some other crypto projects, the goal of the Cardano team isn’t to overhaul the entire financial system. Their aim is to use blockchain technology to bring banking systems to places where they’ve previously been too expensive to implement - specifically the developing world. What we don’t like: The early hype surrounding this coin, it may be that the market has overvalued it, which is rather common in this space. We also don’t like the marketing angle punting that ADA has been developed by academics and engineers. This is the same as every other cryptocurrency in the top 50. However, these objections are not founded in the underlying tech of this coin. Overall, it is very impressive. EOS is a blockchain platform for the development of decentralized applications (dapps), similar to Ethereum in function. It makes dapp development easy by providing an operating-system-like set of services and functions that dapps can make use of. The idea behind EOS is to bring together the best features and promises of the various smart contract technologies out there (e.g. security of Bitcoin, computing support of Ethereum) in one simple to use, massively scalable application platform for the everyday user to empower the impending blockchain economy. But what is it that has really captured the public’s imagination are the claims that they are planning to completely remove transaction fees and are claiming to have the ability to conduct millions of transactions per second. What we like: Simple to code and create dApps as EOS accepts multiple coding languages. Smart contracts are not essential to interacting on the EOS decentralized apps, meaning that "free" services will be possible on this platform, improving mass adoption potential. Dan Larimer, the founder of EOS, has a proven track record in this space as he created Steemit and Bitshares. Furthermore, EOS promises to be highly scalable, which remains to be seen. What we don’t like: The EOS ICO runs for 12 months, with new coins being released daily. This has pros and cons, but the con is that token prices could be propped up artificially (through a form of insider trading) until the release is completed, which could then be followed by a massive dump and price crash. This is purely speculative at this point. Secondly, EOS tokens being released over this 12-month period are done so on the Ethereum blockchain (ERC20 tokens), and have no relation or rights to the actual EOS blockchain that is being created. EOS could thus be overvalued at this point in time and there is an off chance that it may be a complete failure/scam. That being said, the testnet has been launched, so the likelihood of it being a scam is very small I would say. Stellar is an open-source, distributed payments infrastructure. It is a leapfrog technology that connects people, payment systems, and banks with a focus on the developing world. It lets you facilitate multi-currency and asset transactions quickly, reliably, and for a fraction of a penny by using a crypto-asset called Lumens (XLM) as a bridge. The Stellar network runs on a web of decentralized servers supported by an international consortium of individuals and entities.� These servers support the distributed ledger that keeps track of the network’s data and transactions. In practice, the Stellar protocol will function like a more inclusive, more flexible PayPal.� To start using Stellar, you would need to upload funds to an anchor on the network.� Much like a bank or PayPal, this anchor then holds your money and issues credit to your virtual wallet in its stead. What we like: Fast confirmation time, thousands of transactions per seconds and low transaction fees. The Stellar network is a fork of Ripple and thus based on a tried and tested protocol, trying to solve the same problem. The protocol is open-source, as opposed to Ripple, and far more decentralized. What we don’t like: Tokens are pre-mined and do not rely on proof of work to verify transactions, some would argue that this makes the protocol inherently less secure. However, this is the trade-off which makes fast and cheap transactions possible. Dash (formerly known as Darkcoin and XCoin) is an open source peer-to-peer cryptocurrency that offers all the same features as Bitcoin but also has advanced capabilities, including instant transactions, private transactions, and decentralized governance. Dash’s decentralized governance and budgeting system makes it the second decentralized autonomous organization. Dash uses a two-tier architecture to power its network. The first tier consists of miners who secure the network and write transactions to the blockchain. The second tier consists of masternodes which enable the advanced features of Dash. Dash transactions are confirmed in four seconds, while sending Bitcoins to someone can take 10 minutes or more. Unlike Bitcoin, Dash is self-funding. 45 percent of newly created Dash goes to the miners, and 45 percent to masternodes. The rest - 10 percent - goes to a treasury for funding the development team, marketing, customer support centers, and so forth. What we like: Fast confirmation time, on-chain scaling protocol, private send optionality, instant send optionality, and low transaction fees. However, the most appealing factor to us about Dash is their governance structure and treasury. This allows the currency to become a Decentralized Autonomous Organization (DAO), which self-funds itself and votes on proposals which influence the direction the DOA takes. Secondly, the layer two solutions facilitated by the masternode network allow for extra functionality, eliminating the need to use other coins for instant and private transactions. This coin is one of the most attractive in terms of gaining mass adoption as a currency. We would wager it is a sleeping giant. What we don’t like: As scaling takes place, centralization of this coin is inevitable. Masternodes and miners will converge into data centres, creating a single point of attack for malicious actors. Additionally, mining Dash becomes less attractive as the block reward is only 45%, meaning that network security could be compromised, this is however alleviated by the masternode network. Crypto Currencies are not defined as securities in terms of the Financial Markets Act, 2012 (Act No. 19 of 2012). The regulatory standards that apply to the trading of securities, therefore, do not apply to virtual currencies. Because virtual currencies are not regulated, users are not protected and are at the risk of losing money. Transactions are also irreversible. The price of virtual currencies is based on investor sentiment and can rise rapidly, thus attracting investors looking for very high returns from investments. However, the prices of virtual currencies tend to be very volatile and can drop as quickly as they rise. This may encourage speculative behaviour, which in turn spurs more volatility. Financial risks are, therefore, limitless and claims cannot be made for such losses.